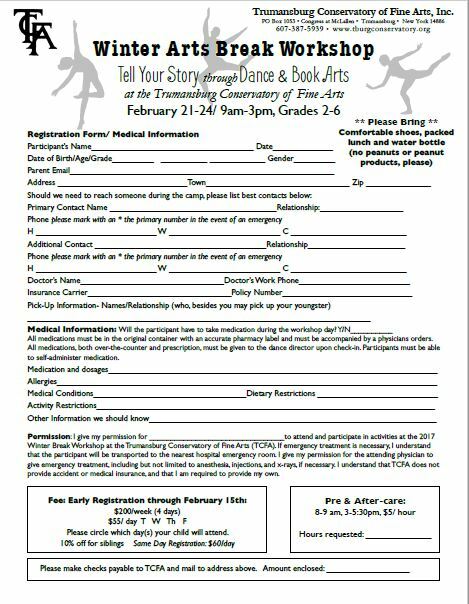 This Winter Break, Feb. 21-24, join at us at TCFA for a fun-filled week of art and dance! Kids Grades 2-6 are welcome. ≈ Comments Off on This Winter Break, Feb. 21-24, join at us at TCFA for a fun-filled week of art and dance! Kids Grades 2-6 are welcome. Register for the entire program (Tues-Friday) or any number of days. Program runs from 9:00 am to 3:00 pm with optional after care until 5:30 pm. Drop-off available from 8:00 am. Children must bring a bag lunch. Snacks provided. Before & after care $5/hr. Same day registration available at an additional fee.